This article is about the 1813 battle. For the World War II battle, see Battle of Bautzen (1945). In the Battle of Bautzen (20–21 May 1813) a combined Russian–Prussian army, that was massively outnumbered, was pushed back by Napoleon I of France but escaped destruction, some sources claiming that Michel Ney failed to block their retreat. The Prussians under Count Gebhard von Blücher and Russians under Prince Peter Wittgenstein, retreating after their defeat at Lützen were attacked by French forces under Napoleon. The Prusso-Russian army was in a full retreat following their defeat at the Battle of Lützen. Finally, generals Wittgenstein and Blücher were ordered to stop at Bautzen by Tsar Alexander I and King Frederick William III. The Prusso-Russian army was nearly 100,000 men strong, but Napoleon had 115,000 troops. Additionally, Marshal Ney had 85,000 more men within easy marching distance. Wittgenstein formed two defensive lines, with the first holding strongpoints in villages and along ridges and the second holding the bridges behind a river bend. Napoleon had planned to pin down his enemies to their lines and then trap them with Ney's troops. However, due to faulty reconnaissance, he became concerned that the Prusso-Russians had more soldiers and held stronger positions than they actually did. So Napoleon then decided he would not set up his trap until they had been softened up. 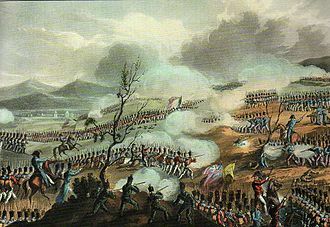 After an intense bombardment by the grande batterie of Napoleon's artillery and hours of heated fighting, the French overpowered the first defensive lines and seized the town of Bautzen. The Prusso-Russians appeared to be buckling. By nightfall, the French were ready to cut the allies off from their line of retreat. But Marshal Ney became confused, and his faulty positioning left the door open for the Allies to escape. Fighting on the following day, the 21st, was again hard and after several hours of setbacks, renewed French attacks began to gain momentum. But these assaults were only intended to fix the allies in place so they could be cut off and enveloped. Once again, Marshal Ney became distracted and decided to seize the village of Preititz [de], and thus lost sight of the strategic importance of cutting off the allies. The Prusso-Russians were being pushed back across the river and, at 4 p.m., when the Imperial Guard was sent in, began an all-out retreat. Without Ney's forces to seal them in; however, they again escaped the total defeat Napoleon had planned. Losses on both sides totaled around 20,000. But some other sources (e.g. Dr Stubner) also say that the losses on French side were significantly higher because of their aggressive attack tactics which failed to cut off the allies from their lines and the allies in fact only lost 11,000 – 14,000. The French victory at Bautzen is therefore often called a Pyrrhic victory. Although a success for the French, Bautzen was not the decisive, strategic result Napoleon was looking for. Ney's failure to cut the line of retreat robbed the French of complete victory. Once more Napoleon had to settle for a narrow, pyrrhic victory. To make matters worse, during the battle, Napoleon's close friend and Grand Marshal of the Palace, General Geraud Duroc, was mortally wounded by a cannonball the day after the battle and died. Following Bautzen, Napoleon agreed to a nine-week truce with the Coalition, requested by the Allies on 2 June 1813. The Armistice of Pleischwitz was signed on 4 June, and lasted until 20 July, but was later extended to 10 August. During this time he hoped to gather more troops, especially cavalry, and better train his new army. The allies, however, would not be idle; they too would mobilize and better prepare, and after hostilities were resumed, the Austrians joined the ranks of the allies. It is reported that Napoleon later (on Saint Helena) said that his agreement to this truce was a bad mistake, because the break was of much more use to the allies than to him. The campaign would resume in August. ^ a b Chandler, D., p.892. ^ a b David Chandler, The Campaigns of Napoleon, p. 1119. ^ a b Chandler, D., p.897. ^ a b Clark, Iron Kingdom: The Rise and Downfall of Prussia, p. 365. Chandler, D. The Campaigns of Napoleon. Scribner, 1966. Clark, Christopher C. Iron Kingdom: The Rise and Downfall of Prussia, 1600–1947. Belknap Press of Harvard University Press. Cambridge, Massachusetts, 2006. ISBN 978-0-674-02385-7. Riley, J.P. Napoleon and the World War of 1813. Routledge, 2000. The Battle of Feistritz saw an Imperial French corps led by Paul Grenier attack an Austrian brigade under August von Vécsey. After putting up a resistance, the outnumbered Austrians were defeated and forced to retreat. The clash occurred during the War of the Sixth Coalition, part of the Napoleonic Wars, Feistritz im Rosental is located on the Drau River near the southern border of Austria, about 16 kilometres southwest of Klagenfurt. When hostilities commenced between the Austrian Empire and Imperial France, Johann von Hiller led an Austrian army to attack the Illyrian Provinces, when the Austrian general established a second bridgehead at Feistritz, Eugène sent Grenier to wipe it out. The minor victory only delayed the inevitable, and within a few weeks Eugène was compelled to abandon Illyria, in 1812, the best French and Italian units from the French Army of Italy were assigned to the IV Corps for the French invasion of Russia. The troops fought well under the command of Eugène de Beauharnais, to rebuild his army in Germany for the 1813 campaign, Emperor Napoleon transferred four more divisions from the garrison of Italy to join the newly established IV and XII Corps. The emperor gave his stepson Eugène permission to organize a new out of French. By May 1813, the new army began forming around the French 46th, 47th, and 48th Divisions, the Italian 49th Division, and one cavalry division. In fact, only 13,000 French conscripts joined the army, since military equipment was scarce, some soldiers were sent to the front dressed in police uniforms. Nevertheless, the continued to expand and Eugène eventually renumbered his divisions 1 through 6. Meanwhile, the Austrian Empire prepared for war with Napoleon by expanding their army, while their main army was based in Bohemia, Austria stationed one army corps on the Danube and another in the Duchy of Carinthia. The troops in Carinthia were placed under the command of Feldzeugmeister Johann von Hiller, since it was considered a minor theater, Hillers army only counted 35,000 soldiers and 120 artillery pieces in August. This total was smaller than the number of troops in his opponents army, the Austrian general had veteran division and brigade commanders, but he was handicapped by a clumsy command system and large numbers of indifferently-equipped conscripts in the ranks. 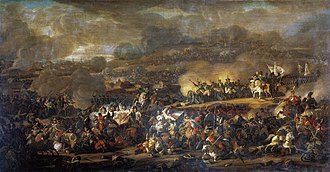 The Battle of Dresden was a major engagement of the Napoleonic Wars. The battle took place around the city of Dresden in modern-day Germany, with the recent addition of Austria, the Sixth Coalition felt emboldened in their quest to kick the French out of Central Europe. Despite being heavily outnumbered, French forces under Napoleon scored a modest victory against the Allied army led by Field Marshal Schwarzenberg, Napoleons victory did not lead to the collapse of the coalition, and the lack of effective French cavalry units precluded a major pursuit. A few days after the battle, the Allies surrounded and captured a French corps at the Battle of Kulm. On 16 August, Napoleon had sent Marshal Saint-Cyrs corps to fortify and hold Dresden in order to hinder allied movements and he planned to strike against the interior lines of his enemies and defeat them in detail, before they could combine their full strength. He had some 300,000 men and 800 cannons against allied forces totaling over 450,000 and 1200 cannons, but the Coalition avoided battle with Napoleon himself, choosing to attack his subordinate commanders instead. 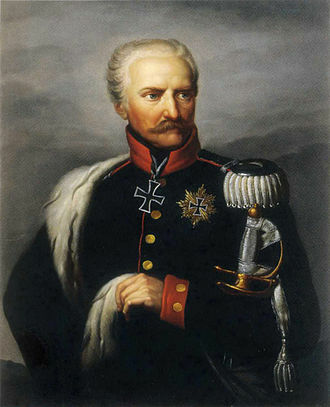 On 23 August, at the Battle of Grossbeeren, south of Berlin, and on 26 August, Prussian Marshal Blücher defeated Marshal MacDonald at the Katzbach. In Dresden, French infantry manned the various redoubts and defensive positions and they hoped to last long enough for reinforcements to arrive. Sure enough, they got their wish, Napoleon arrived quickly and unexpectedly with reinforcements to repel this assault on the city. French counterattacks on the Great Garden in the southeast and on the center were successful. Although outnumbered three to two, Napoleon attacked the following morning, turned the allied left flank, and won a tactical victory. The flooded Weisseritz cut the wing of the Allied army, commanded by Johann von Klenau and Ignaz Gyulai. 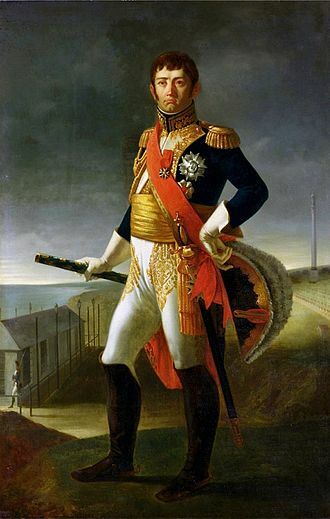 Marshal Joachim Murat took advantage of isolation and inflicted heavy losses on the Austrians. A French participant observed, Murat. cut off from the Austrian army Klenaus corps, nearly all his battalions were compelled to lay down their arms, and two other divisions of infantry shared their fate. Bautzen is a hill-top town in eastern Saxony and administrative centre of the eponymous district. It is located on the Spree River, as of 2013, its population is 39,607. Asteroid 11580 Bautzen is named in honour of the city, Bautzen is often regarded as the unofficial, but historical capital of Upper Lusatia, and it is the most important cultural centre of the Sorbs, a Slavic people. The town on the River Spree is situated about 50 km east of Dresden between the Lusatian highland and the lowlands in the north, amidst the region of Upper Lusatia, to the north stretches the Bautzen Reservoir, which was flooded in 1974. This is the location of the villages of Malsitz and Nimschütz. The old part of Bautzen is located on the plateau above the Spree and it is bordered by the city walls. The later-built more recent quarters in the east were enclosed by the city ramparts, after their removal, the city expanded further east and to the left bank of the river. However, there has only been an urban area west of the Spree until today. In the 1970s, the development areas of Gesundbrunnen and Allendeviertel were erected, after 1990, several neighbouring villages were incorporated. The city is bordered by Radibor, Großdubrau and Malschwitz in the North, Kubschütz in the East, Großpostwitz and Doberschau-Gaußig in the South, all of these belong to the Bautzen district. The 15 city districts are, Innenstadt,5278 inh, in the 3rd century AD an eastern Germanic settlement existed here, but excavations have proved that the region was already inhabited as early as the late Stone Age. Sorbs arrived in the area during the Migration period in the sixth century AD, the first written evidence of the existence of the city was in 1002. In 1015 the Polish Army led by Bolesław I Chrobry defeated, in 1018 the Peace of Bautzen was signed between the German king Henry II and the Polish prince Boleslaus I. 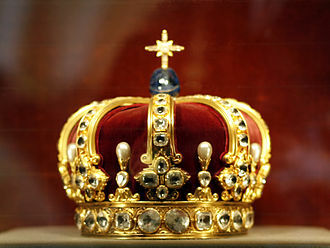 The Treaty left Bautzen under Polish rule, in 1032 the city passed to the Holy Roman Empire, in 1319 to Czech Crown lands and in 1635 to Saxony. Gathering up his outnumbered forces, Napoleon rushed his soldiers south to deal with Schwarzenberg. Hearing of the approach of the French emperor, the Allied commander ordered a withdrawal, ordered to hold Montereau until nightfall on the 18th, the Crown Prince of Württemberg posted a strong force on the north bank of the Seine River. All morning and past noon, the Allies stoutly held off a series of French attacks, under increasing French pressure, the Crown Princes lines buckled in the afternoon and his troops ran for the single bridge to their rear. Brilliantly led by Pierre Claude Pajol, the French cavalry got among the fugitives, the Allied force suffered heavy losses and the defeat confirmed Schwarzenbergs decision to continue the retreat to Troyes. On 10 February, the Army of Bohemia under Karl Philipp, on the right, Peter Wittgenstein and Karl Philipp von Wrede headed for Nogent and Bray on the Seine River supported by the Guards and Reserves. On the left, Crown Prince Frederick William of Württemberg moved on Sens with the I Corps of Frederick Bianchi, the left flank forces were backed by Ignaz Gyulais corps. The Allies were briefly checked at Nogent on the 10th by 1,000 French troops under Louis-Auguste-Victor, Sens was taken on the 11th after a skirmish between the Crown Prince and Jacques-Alexandre-François Allix de Vaux. Tasked with the defense of the Seine, Marshal Claude Perrin Victor held Nogent, on the 12th the Allies captured Bray from a weak force of French National Guards as well as the bridge at Pont-sur-Seine near Montereau. Afraid of being surrounded, Victor evacuated Nogent and fell back, the appearance of troops under Marshal Jacques MacDonald did not stop the retreat and by 15 February the French were moving back to the Yerres River only 18 miles from Paris. Alexander Nikitich Seslavin led a force of three Russian hussar squadrons and one Cossack regiment well to the south to seize Montargis and threaten Orléans. Auxerre was stormed and its garrison wiped out, Cossacks roamed freely in the Forest and Palace of Fontainebleau. When Victors wagon train appeared at Charenton-le-Pont the Parisians were thrown into panic, fleeing peasants reported that Paris would soon be attacked by 200,000 Cossacks. The Battle of Leipzig or Battle of the Nations was fought from 16 to 19 October 1813, at Leipzig, Saxony. 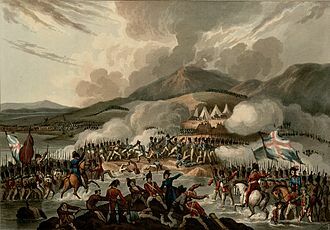 Napoleons army contained Polish and Italian troops, as well as Germans from the Confederation of the Rhine, the battle was the culmination of the 1813 German campaign and involved nearly 600,000 soldiers, making it the largest battle in Europe prior to World War I. 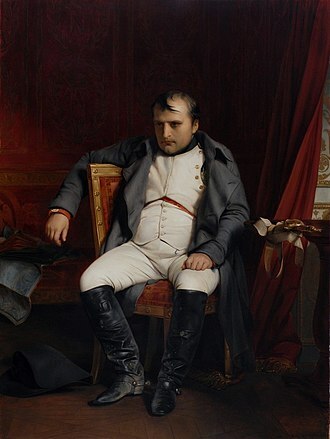 Being decisively defeated for the first time in battle, Napoleon was compelled to return to France while the Coalition hurried to keep their momentum, Napoleon was forced to abdicate and was exiled to Elba in May 1814. However, the Russian Tsar refused to even as the French occupied the city. With this string of defeats, the armies of France were in retreat on all fronts across Europe, anti-French forces joined Russia as its troops pursued the remnants of the virtually destroyed Grande Armée across central Europe. He sought to regain the offensive by re-establishing his hold in Germany, the victories led to a brief armistice. He won a victory at the Battle of Dresden on 27 August. This policy led to victories at Großbeeren, Katzbach, after these defeats, the French emperor could not easily follow up on his victory at Dresden. With the intention of knocking Prussia out of the war as soon as possible, Oudinot was defeated at the Battle of Großbeeren, just south of the city. With the intact Prussian force threatening from the north, Napoleon was compelled to withdraw westward and he deployed his army around the city, but concentrated his force from Taucha through Stötteritz, where he placed his command. The Prussians advanced from Wartenburg, the Austrians and Russians from Dresden, the coalition had some 380,000 troops along with 1,500 guns, consisting of 145,000 Russians,115,000 Austrians,90,000 Prussians, and 30,000 Swedes. This made Leipzig the largest battle of the Napoleonic wars, surpassing Borodino, Wagram and Auerstadt, Napoleon conscripted these men to be readied for an even larger campaign against the newly formed Sixth Coalition and its forces stationed in Germany. Rain having rendered small arms fire impossible, Saxon infantry (left) use musket butts and bayonets to defend the churchyard at Großbeeren against a Prussian onslaught. Medal for the opening on 23 August 1913 of the memorial tower at Großbeeren, commemorating the 100th anniversary of the battle, reverse. View from Schloss Hollenburg toward the south bank of the Drava at Kirschentheuer. The Austrian grenadiers crossed a bridge at this location to reinforce Vécsey. Feistritz is located 7 kilometers to the right (west). 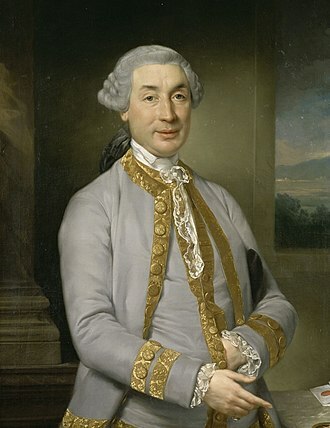 Marshal Nicolas Soult by L.H. de Rudder. French soldiers spare the life of the Russian soldier Leontiy Korennoy for his bravery. 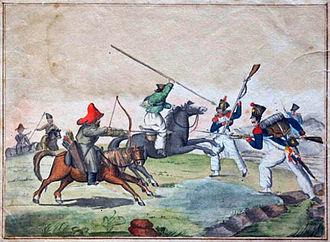 French soldiers in skirmish with Bashkirs and Cossacks. Kleist's Prussians may have witnessed a scene like this as the 2nd Old Guard Division advanced toward them. Photo is from a Battle of Waterloo reenactment. The Jura Mountains can be seen from Saint-Julien. The view is east along the Chemin des Dames with Heurtebise Farm at left. The French advance came toward the viewer. The battle of Craonne, by Theodore Jung. Bavarian infantry crossing the Kinzig bridge. Pajol leading the charge at Montereau. Napoleon was nearly taken by the Cossacks after the Battle at Brienne, but was saved by French general Gourgaud. Lutzen, Battle of (1813). 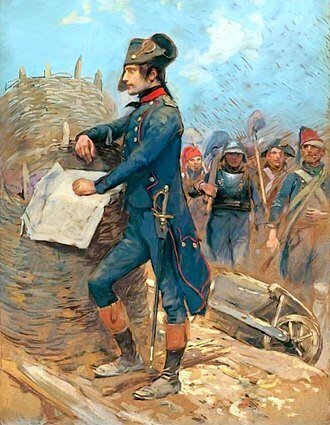 Napoleon with his troops by Andreas Fleischmann.